Want details and data? Watch our video review or our technical overview. Kreft Moto converts the Xplor fork into a high performance damper capable of adapting to any terrain and any rider - from beginner to pro. 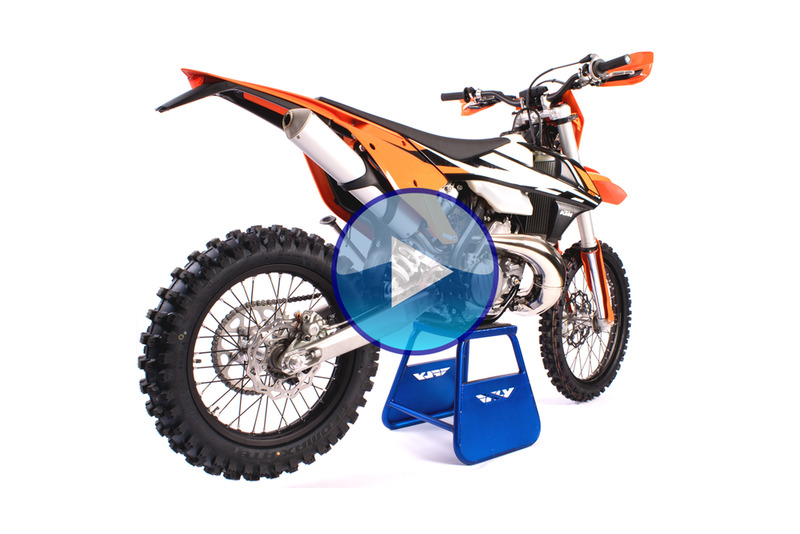 Thanks to our ground breaking Revalve Control system, Kreft Moto Xplor has highest degree of versatility ever seen in a production or aftermarket fork. Improved versatility means improved performance potential. The chart on the right shows damping forces in the left and right stock Xplor fork legs. Notice that the blue curve (right leg) does 100% of the rebound damping (shown as negative forces), and about 66% of the compression damping (positive forces). This asymmetry is a poor design for an open cartridge fork because it causes excessive cavitation and hysteresis. Cavitation is the technical term for gas bubbles forming in the fluid. Fork fluid contains dissolved gasses that can materialize into tiny but visible bubbles when a pressure drop occurs. The same thing happens when you open a bottle of soda -- bubbles dissolved in the fluid when under pressure become fizz when the container is depressurized. The more damping force is created, the greater the pressure drop across the valve. Rear shock absorbers generate much more damping force than a fork, and consequently they are pressurized to 150 psi to reduce the risk of cavitation. The WP AER fork is also an asymmetrical damper, but the design wisely includes a powerful pressurization system. Though Xplor is asymmetical, it is unpressurized and as a result suffers from severe cavitation. Why is cavitation bad for fork performance? Fluid filled with bubbles produces much less damping force than a stable fluid. Normal damping force returns after the bubbles collapse, but meanwhile the fork has lost travel. When you strike a bump, the amount of force transmitted to the rider is directly proportional to the travel your suspension uses to absorb the bump (F=ma). A non-cavitating fork distributes the bump force more evenly across it's available travel, creating even, predictable dampig right from the moment of impact. A cavitating fork blows through the aerated fluid, and then has less travel available to absorb the bump once the the bubbles collapse. THAT MAKES THE FORK FEEL HARSH! Cavitation is also extremely destructive to the fork fluid. Cavitation bubbles have been measured at over 6000° C (for a brief moment) and are known to destroy industrial valves and boat propellers, among other things. In stock form, the right fork leg does all the work. Kreft mods distribute damping duties evenly between both fork legs. Revalve Control is the only fork adjustment capable of altering the slope of the damping curve. Traditionally, that would be accomplished with suspension revalve. 1. The stock Xplor fork has a very narrow compression adjustment range, and low speed compression cannot be adjusted at all. → Kreft XPlor with Revalve Control provides total control of the damping curve. 2. The stock Xplor fork places 66% of compression damping and 100% of rebound damping in the right fork leg. The unequal distribution of damping force creates excessive cavitation in an open-cartridge fork. Cavitation and the resulting hysteresis causes harshness, fade, unpredictable damping behavior, and rapid fluid breakdown. → XPlor with Revalve Control divides damping duties equally between both fork legs, reducing the danger of cavitation. 3. Identifying and satisfying an individual customer's suspension preferences is the most challenging part of being a suspension tuner. No matter how much information we gather, it is nearly impossible to fully understand his requirements. In some cases, the customer himself does not know or does not know how to articulate what he wants. In other cases, the requirements vary so widely that any single suspension setup is incapable. → Kreft Moto's XPlor with Revalve Control eliminates the need for guesswork. Revalve Control puts the full power of a professional tuner at your fingertips, enabling customers to test and experience different types of valving configurations (based on our settings chart) for the first time. 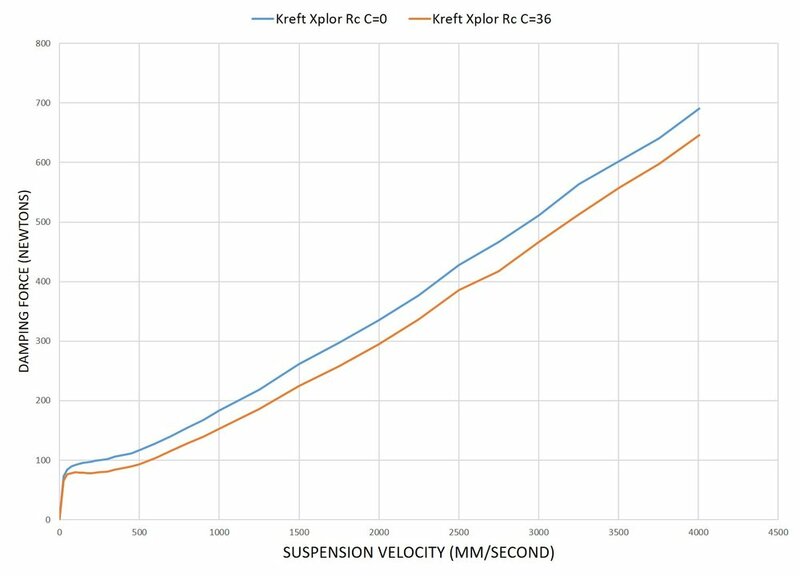 Furthermore, if a performance issue does arise, it is much more likely Kreft Moto can resolve the issue at a distance, rather than requiring shipping back to the suspension shop for a valving revision. This is the traditional function of compression "clickers"